can stand out in the inbox and rise above the clutter and competition? To successfully get prospects to raise their hands and engage with offers, BtoB marketers need to provide content that is targeted, engaging and delivered in a compelling multimedia format, via multiple channels and accessible on multiple types of devices. 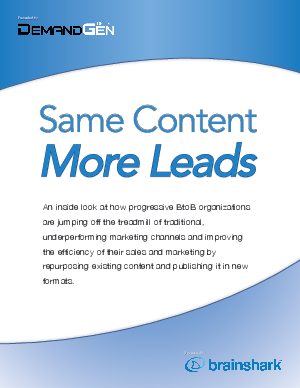 This white paper will provide an inside look at how leading marketers are reaching more prospects by repurposing existing content and delivering it in a creative, targeted and measurable format that fuels successful lead generation—while also saving time and money.